Did You Consider Your International Operations in Emerging Markets? What is the Economic Value of Renewable Energy for Corporations? On our blog today, BayWa r.e. Solar Projects’ CEO, Jam Attari, shares how to communicate the undeniable economic value of renewable energy for corporations to your key stakeholders. Jam describes the importance of strategically curating your message to meet enterprise-wide goals. Procuring energy today is a more complex endeavor than it was in the past. Previously, the facilities manager procured energy on behalf of the organization and it was accepted as an unpredictable overhead cost necessary for operations. Today, the energy procurement team has grown significantly to include not only the facilities manager but also the CEO, CFO and you, the Sustainability Leader. This expanded list of stakeholders is now involved because energy procurement is now a strategic sourcing activity with the power to produce a competitive advantage, both economically and reputationally. Identifying what is most important to your organization at an enterprise level provides a common goal to rally around in all activities, including energy procurement. Today, I’d like to share from my experience some of the proof points for how renewable energy can economically support your organization’s goals. 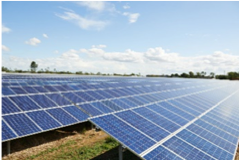 Cost savings is often a top enterprise-wide goal that renewable energy can powerfully support. The cost curves for renewable energy technology have come down and are very stable. As a result, there is a literal dollar risk to not procuring today. According to Lazard’s Levelized Cost of Electricity (LCOE) 2017 edition, unsubsidized onshore wind and utility-scale solar are less expensive than new coal energy solutions and on par with new combined-cycle natural gas. 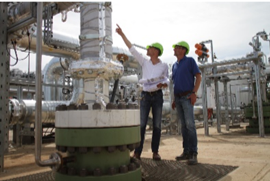 LCOE allows comparison across different technology by factoring initial cost and lifetime operating costs. The economic value of renewable energy for corporations is so strong that renewables collectively saved Fortune 500 companies $3.7 billion in 2016. As another compelling example, T Mobile recently joined the RE100 and made the commitment to reach 100% renewable energy by 2021. As John Legere, President & CEO of T Mobile, says: “And it’s not just the right thing to do – it’s smart business! 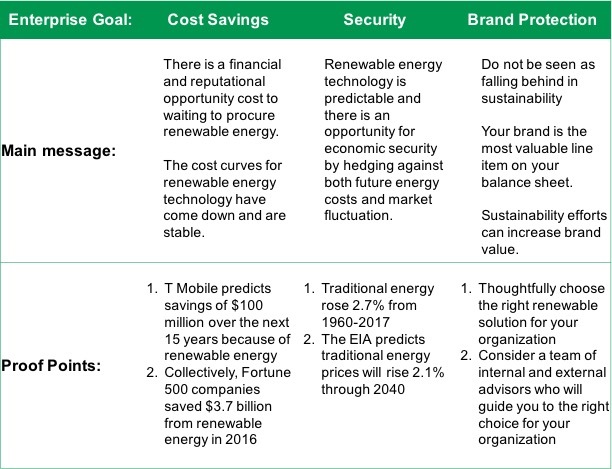 We expect to cut T-Mobile’s energy costs by around $100 million in the next 15 years thanks to this move.” Share these proof points with your energy procurement stakeholders and win them over with the financial cost of waiting to procure renewable energy solutions. A Virtual Purchase Price Agreement (PPA) allows you to lock in energy prices today. This vehicle allows you to procure more energy than an onsite solution, as well as secure the energy your organization needs at a lower long-term price. Tim Cook, Apple’s CEO, described the benefits of their solar CfD: “We are doing this because it’s right to do, but you may also be interested to know that it’s good financially to do it. We expect to have significant savings, because we have a fixed price for the renewable energy, and there’s quite a difference between that price and the [future] price of brown energy.” Share these facts with your team if security is the main goal of your organization. Renewable energy procurement can increase brand value as you show consumers that your organization values doing the right thing. As the market rapidly adopts renewable energy, it is key for your organization to not be left behind, or better yet, to lead the way. Considering renewable energy solutions as a piece of your brand strategy allows you to thoughtfully and proactively choose the right solutions that meet your sustainability goals. You can explore possibilities such as: virtual PPAs and onsite solutions. 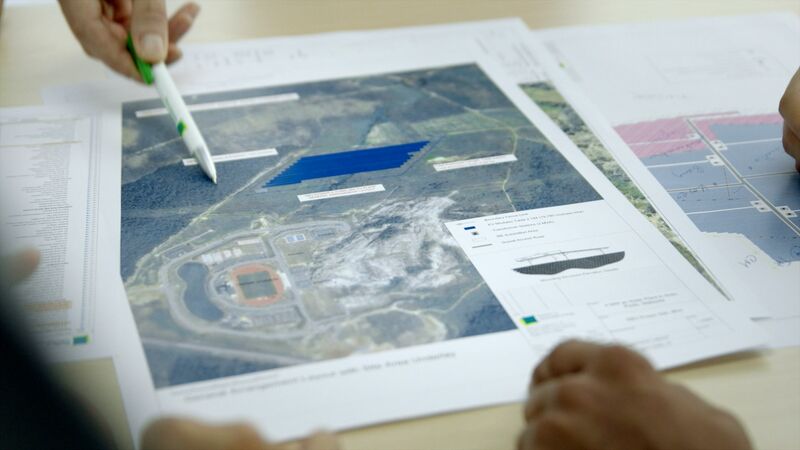 Layering a virtual PPA with an onsite solution helps your company meet your carbon goals more holistically than the individual construction and also builds your brand with a physical renewable presence. Lastly, consider the right partners as you explore the best renewable options for your company. These are agreements can last from 10-25 years. Ensure you select partners who will be by your side for the duration of your agreement. Choose partners and advisors who can coach you on the risks in different markets and help you mitigate these risks contractually. What Message Does your Organization Need to Hear? I hope you feel equipped with the economic value of renewable energy for corporations and how renewable energy solutions best address a variety of enterprise-wide goals. Below you will find a summation of key messages and proof points for the 3 categories described above. It is my hope that this chart will help you match your messaging and supporting evidence to your internal audience. You might even want to share an overview of these economic proof points to those on your procurement team. To make this easy – I have compiled a short video that summarizes the economic value of renewable energy for corporations that you might consider sharing. Today, I focused on how you can share the economic value of renewable energy in the context of broader enterprise goals. Next month, Rebecca Sternberg, our Vice President of Power Marketing, will share her own personal experience of successfully gaining internal buy-in and activating a sustainability plan. Check back at the end of next month to read Rebecca’s time-tested best practices on being an internal champion for sustainability in your organization.